Are you looking for an easy but exquisite meal that will knock your socks off, but won’t knock you off your New Year’s resolution to eat lean? You can’t go wrong with this pork specialty. 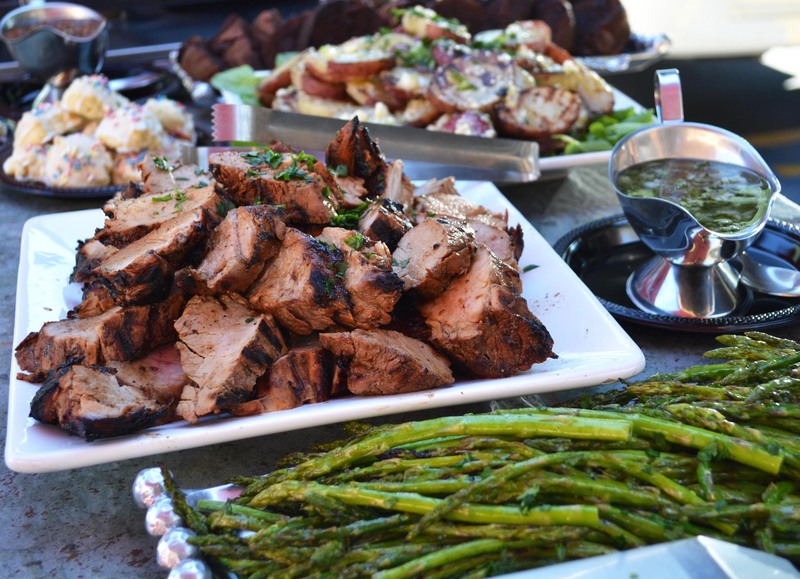 The moment I tasted it, it was love at first bite – for me and for everyone else at the event that Scottsdale Chef Linda Martin was catering. A Guava Glazed Pork Tenderloin with Cuban Salsa, prepared by Chef Martin, was all people could talk about, and I couldn’t wait to get my hands on the recipe and serve this ultra-flavorful dish to friends and family. Linda Martin is a Le Cordon Bleu trained chef with more than 14 years of experience and a Valley favorite. She is well-known as a popular chef at Sweet Basil Cooking School and Gourmetware in Scottsdale, the featured chef for Dacor Luxury Appliances, and the owner of her own catering company, Linda’s Dinner Designs. I’ve had many dished created by Chef Martin, but the Guava Glazed Tenderloin has become an all-time favorite. Thank you, Chef Martin, for sharing it! Place a saucepan over medium high heat. Add enough oil to lightly coat the bottom of the pan. When the oil “shimmers,” add the onion and cook for 5 minutes. Add the garlic and cook for 1 minute. Add the guava nectar and bring to boil. Cook over high heat until reduced to 1 cup. Add the soy sauce, ketchup, cayenne pepper, and salt. Cook for 1 minute. Remove from heat and let cool. Set the pork in a 9" x 13" baking dish. Brush all sides of the pork with half of the glaze. Light grill to medium high heat. Grill the pork, turning and brushing with the remaining glaze until browned on all sides (about 15 minutes), or until cooked thoroughly (with an instant read thermometer 150ºF). Transfer the cooked pork to a cutting board and let rest 10 minutes. While the pork is resting make the salsa. In a bowl, mix the cilantro, oil, vinegar, onion, chives, jalapeños and garlic. Season with salt. Transfer to a serving bowl. To serve, slice the pork into ¼ -½" slices. Arrange on a serving platter. Pour any accumulated juices over the pork. Garnish with cilantro sprigs and serve the salsa on the side.